Sigh. February, and I’m trying to be back. I have plenty of insecurity. 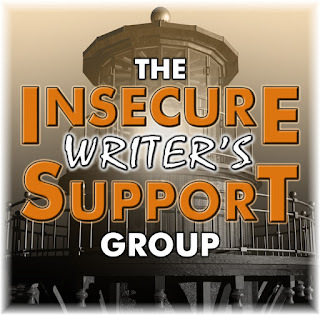 Welcome back me and everyone, to the Insecure Writer’s Support Group! On the first Wednesday of every month, bloggers get together to share their thoughts and experiences, and find/offer support across the blogosphere. ISWG is captained by Alex J. Cavanaugh. The awesome co-hosts for today are Misha Gericke, LK Hill, Juneta Key, and Joylene Buter! Please also be sure to congratulate the new site admins, Heather M Gardner and C. Lee McKenzie. Now on to my issues. Late fall and early winter was a chaotic time in our household. Bear and I bought a new house. To clarify, new to us. It is, in fact, a rather old house. And it needs a lot of work. We’ve been spending the last couple months doing as much of the demo as we can ourselves and scraping together as much cash as possible to pay professionals for the things we can’t do. So, I’ve had to work more hours to bring in more funds. Bunny is also getting older, and while he’s more independent, he’s certainly not ready to take care of himself. We’re in the midst of potty training at the moment, and he’s learning how to dress himself. It’ll be a long time before all I have to do is bang on his door in the morning and leave him on his own to get ready. As such, writing has fallen off considerably. I am still writing. I did a short piece for a contest a few weeks back. I’ll post the story here in a few weeks after winners are announced. I’m critiquing quite a bit to keep up my membership on the two critique sites I use. My short story, “Wilde Born,” is chugging along (Chapter 5 out this Friday!) and sometime after that’s finished, I’ll be releasing Chalice. I have plans to submit a few works to ebook publishers, and with any luck, next winter I’ll be able to work on the revision for Cry of the Hawk, the third novel in the Threads series, and finally get it published. All is moving slowly, but steadily. I feel a bit melancholy about this update, for many reasons. I’m sad that I don’t have as much time for writing or my blog, though I hope that will change once things even out a little. Wish me luck and good luck to all of you as we head into the second month of 2017. Sounds like you’ve had a busy few months. Good for you that you keep chugging along with your writing anyway. Progress, no matter how slow, is still amazing progress! Its pretty common to have periods that are more and less productive. Definitely happens to me. Life happens. Key is to know that you can come back. Good luck. Oh hang in there. We all go through weird spells during our writing career. You’ll get inspired and then the words will flow. Good luck to you on your writing goals and on everything else you have going on. I learned a long time ago that my husband and I are not handy at all. The thought of us even attempting any kind of demolition cracks me up. GOOD LUCK! Sounds like you’re actually doing pretty well considering that you have so much on your plate. Try not to be discouraged, it will all come together. Keep writing, even if it’s only a few words each day. Blogging can wait, if it has to. for me Blogging is the last thing on the list, when life gets in the way. Your blog friends will understand. Potty training! One of the more discouraging events in a parent’s life. I potty trained five children, so I know. Your tramping along in the trenches right now, but your future is bright. A home just the way you like it. A child who will one day thank you for that he didn’t go to kindergarten still wearing pull-ups. And you’ll find time to write. As others have said, a little here a little there. It does add up. Good luck and hang in there! These things all pass. We all do the best we can. Take care! Moving can be VERY disruptive, but it always calms down over time. Sounds like you have a lot going on in addition to that. Blogging can definitely wait!